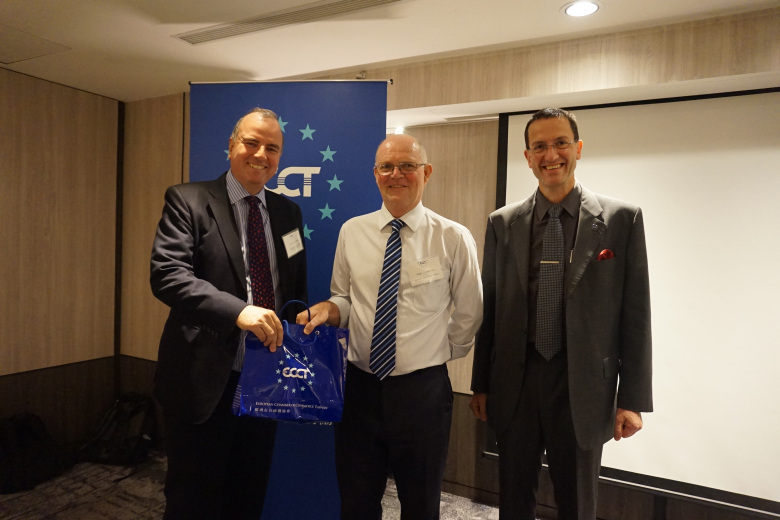 The ECCT's Education committee arranged a lunch with guest speaker David Gatley, CEO of the Taipei European School (TES). At the event the speaker gave an update on the on TES management, policies and development plans. The management team of TES has been streamlined from the previous executive leadership team of 15 people (mostly operational) to a team of seven people, five of which are education experts and two administrative experts, in order to ensure the main focus of the school is on ensuring a high standard of education. In addition, there has been a complete policy review covering admissions, safety and child protection. The school is now also paying more attention to the accountability of all staff to ensure that they understand and are meeting expectations. TES currently has 1,780 students. Previous development plans had called for a large expansion of school buildings in order to increase enrolment to 2,260. However, after a re-evaluation, the case was made that there was a risk of overcrowding, which would diminish the quality of education. Therefore, it was decided to revise development plans for the purpose of improving the quality of education and facilities rather than for the purpose of accommodating more students. For example, the physical size of classrooms in future will be larger and new facilities will include gyms and laboratories. In terms of enrolment, recruitment efforts will be less aggressive in future. In addition, rather than filling classes to capacity at the start of the school year, some spaces will be reserved in each class to cater to families that arrive after the start of the school year. The school’s governance structure has also been streamlined. Previously the school had six separate boards with a total of 57 members: one each for the British primary school, the British high school, the French school, the German school, a board of governors and a board of directors. With so many disparate boards, often working in isolation, it was inevitable that interests would not always been aligned. In addition, given that each board had its own budget, there tended to be spending disparities and a lack of strategic long-term planning. Following a decision to streamline governance, there is now a single board of nine directors comprising the school’s founders, one member from the Swire Group, members from professional fields, parents, the European community and Taiwanese professionals. TES is accredited by five agencies from Europe, a result which was achieved after considerable efforts and numerous inspections. The curriculum-related agencies are the International Baccalaureate (IB), the AEFE (Agence pour l'enseignement français à l'étranger, translated in English as the Agency for French Education Abroad) and the German State of Thuringen. In terms of operations, TES is working with the Council of International Schools (CIS), which provides a rigorous evaluation of schools against internationally-agreed standards and WASC. Accreditations from these institutions cover the purpose and direction, governance, leadership, curriculum, teaching, students’ learning and well-being, staffing, premises, community and home partnerships, among other factors. The German School section is certified by the ZfA (Zentralstelle für das Auslandsschulwesen, translated as Central Agency for Schools Abroad) to offer accredited German curriculum while the French section is certified by AEFE to offer French curricula. There is no national accreditation in the UK but the IB follows UK curricula. TES also provides language support to students whose native language is not English, French or German. The school recognises the importance of counselling. In this regard a full-time educational psychologist has been hired. While the school does cater to special needs, its capacity in this regard is limited.